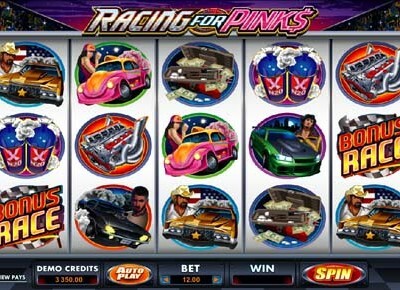 Racing for Pinks is a serious street racing Vegas pokie from Microgaming. This slot is set over 5 reels with 243 ways to win on each spin. The symbols you will come across depict hotted up racing cars, roaring engines and a stash of cash. If you need to leave the room for a minute there is an auto play function when keeps the reels spinning automatically. The Bonus Race symbol landing on reels 1 and 5 wins the BONUS RACE function. Here you can win up to 175X your original bet. All you need to do is pick the correct winner for each race to advance to the next level. If you successfully pick all 5 races then you win the grand prize. The racing cheer girl scatter symbol is key to winning free spins. When she lands on reels 1 and 5 you win up to 30 free spins with up to 5X multiplier. The bonus can be re triggered anytime during the free spins. You can enjoy the free version of racing for pinks pokies by clicking the above link, alternatively the game can be played with real money at the following online casinos. The highest paying symbol is the Racing For Pinks logo which also acts as WILD.